WINTER SPECIAL- ENJOY NOON CHECK-OUT!! Stunning 5 Bedroom House, ideal for families and groups of friends, with plenty of room to relax together and on your own. Featuring a spacious open plan layout across the kitchen, dining, living area & Balcony upstairs, as well as 5 oversized comfortable Bedrooms (each with TV), 3 modern bathrooms (one with a bath) and a second Lounge Room Downstairs. Unlimited NBN Wireless Broadband for all your devices. Air Conditioning and heating upstairs and downstairs or enjoy the lovely sea breeze that cool a summer’s day. 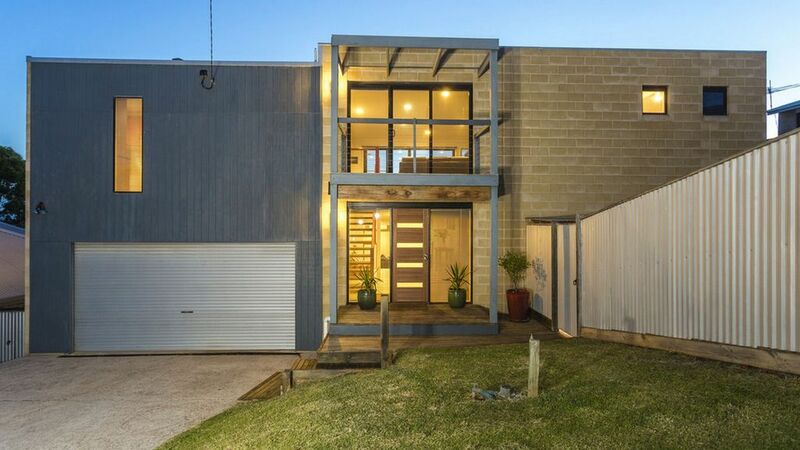 Address is 8 Parma Crescent, Ocean Grove. 1km to Collendina Beach & Ocean Grove Hotel, 700m to Woolworths Shopping Centre (with eating options) & 5min drive to The Terrace. UPSTAIRS is light filled with panoramic views. Dining Room has a 8 seater hardwood table. Kitchen has modern appliances, pantry essentials, cookware and dinnerware, perfect for self-catering. Outdoor “Entertainers” deck is double-sized, with lounge setting, outdoor table, Weber BBQ & sweeping views. Master Bedroom with Queen Bed and a Bathroom. Bedroom #3 one Queen Bed. We take great pride in offering our holiday home. We make sure that the furniture is up to date and the house is presented in the best way for you to enjoy your stay. You will love how comfortable and spacious it is, enabling you to spend time with your group, as well as seeking out some private time. The house was designed to have zones, that make it ideal for extended families. Downstairs there are two separate wings, each with 2 Bedrooms and Bathroom, and then upstairs is the Master Bedroom with ensuite. Expansive panoramic views across sand dunes. Unlimited NBN Wifi for all your devices. Vittoria Espessotoria capsule machine. Some capsules provided & then you can purchase at Coles or Woolworths. Make sure you only buy capsules that are "espressotoria system" NOT Nespresso capsules. Stunning property! Perfect holiday spot! Thanks Andrew for letting us stay in your gorgeous property. The place was amazing and the layout ideal for families. Very well equipped home with all the necessary equipment to enjoy cooking in the big kitchen. Andrew was fabulous to deal with as well, very prompt in answering questions and helping with any issues. We will be back for sure, thanks again! Great house with comfortable fittings. The host was very accommodating with check-in and out times. We had a great 4 day stay at Seaview. There was 4 couples (8 adults) and the house was spacious enough with 4 comfortable queen size beds and 3 bathrooms and still another spare bedroom. The open plan living space was excellent. The outdoor living area would have been good but as it was winter we stayed indoors where it was nice and cosy . In all a great property and congratulations to the owner who sent clear and precise instructions so no need to contact during our stay. Great place to relax and enjoy everything this house has to offer. This house had everything we needed for a girls catch up weekend. Well sized bedrooms, 2 lounge areas, great outdoor deck and a big kitchen. We all enjoyed the stay and hope to return in the future.